at the Montana Natural Heritage Program. Montana Natural Heritage Program (MTNHP) is pleased to be extending its long-term partnership with the Bureau of Land Management by providing support to Terrestrial and Aquatic AIM efforts in Montana and Idaho in 2019. The Assessment, Inventory, and Monitoring (AIM) strategy is targeted at collecting standardized inventory and long-term vegetation, soils and water data at multiple scales across BLM Districts in the Western U.S. This information is utilized by the BLM to make decisions that meet resource management objectives. Our work will encompass Northcentral Montana (Havre and Lewiston) and Central and Eastern Idaho (Idaho Falls, Salmon, Challis, Pocatello, Cottonwood and Upper Snake). We've assembled a group of talented, dedicated technicians to assist in this effort. MTNHP is seeking a Seasonal Field Botanist. The Seasonal Field Botanist will be working as part of a small field crew to assess wetland ecological conditions throughout Montana. The fieldwork involves extensive collection of vegetation, soil, and environmental data, identification of plant species, and completion of field survey forms. Willingness to travel extensively during the field season, work unusual schedules, camp, and backpack into remote areas of Montana is expected. Some office work in Helena may be required. Principle duties include 1) leading a vegetation sampling and identification team in wetlands in both the Rocky Mountains and the Great Plains of Montana; 2) assisting in various duties related to wetland assessment using standard protocols. The Seasonal Field Botanist must be able to accurately identify wetland and riparian plants to species, and assess their areal cover at the sampled sites. Montana Audubon recognizes MTNHP as 2017 Conservationist of the Year. Each year Montana Audubon recognizes its heroes and honors its champions at our Bird Festival. In order to do our conservation work, it is essential for us to understand where wildlife species live in our state and how their distribution and population changes over time. Because of their critical role in wildlife and ecosystem information, we recognized the Montana Natural Heritage Program with our 2017 Conservationist of the Year Award. 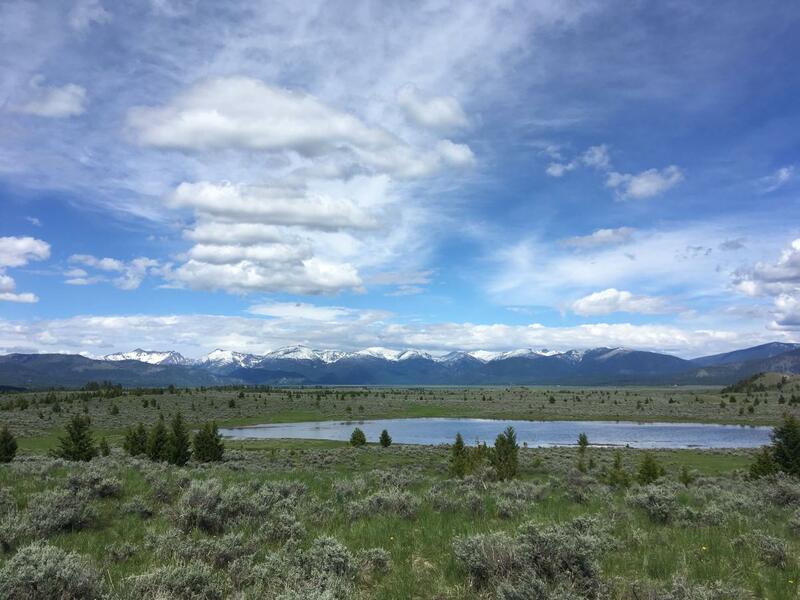 Montana Audubon is particularly grateful for the programï¿½s housing of the Montana Bird Distribution database, mapping Important Bird Area boundaries, and developing the stateï¿½s first wetland and riparian habitat maps. So how is Heritage Program data used? The information is primarily used in environmental reviews conducted by local, state, federal, and tribal governments, and private consulting firms, to better understand the impacts of mining, timber sales, subdivisions, utility and pipeline corridors, oil and gas developments, highway construction projects, and more. Good information is critical to protecting and maintaining our stateï¿½s valuable natural heritageï¿½especially as the state continues to grow and develop. We are pleased to recognize the Montana Natural Heritage Program for this work in this area. Internships available with the Montana Natural Heritage Program, June-August 2017. The Montana Natural Heritage Program is seeking interns for field work in and around Southwest Montana. Work is varied but will focus on vegetation data collection in sagebrush ecosystems and assessment of vegetation, hydrology, soils and landscape context in fire-affected wetlands and/or riparian areas. Some small mammal trapping may be involved. The ideal candidate will be enrolled in, or a recent graduate of, a college-level program in Botany, Range Science, Forestry, Zoology, Geography or Environmental Science. No previous experience in field data collection is required, but we do need to see references from someone who can attest to your reliability, maturity, and willingness to work. The work schedule requires long days in the field, often in challenging environments or conditions, with at least one other crew member. Work generally involves 80 hours over a two week period, although the distribution of the hours may vary depending on field work location (e.g, two four day, 10-hour a day periods; one eight-day, 10 hour a day period, etc). We can be flexible to a certain extent to accommodate other obligations an intern might have. College credit may be arranged for UMT and MSU students, others should consult with their Universityï¿½s advisers. Compensation is $8.15/hr plus a $23 per day stipend for field days. You must have reliable transportation to meet up with crew leaders, or live in/around Helena. A valid driverï¿½s license is required. from your own list of species. Look towards the bottom of the Advanced Search page and you'll find a neat little tool. Enter Scientific Names in the order you want them displayed in the PDF. We will check to make sure all Scientific Names are correct and prompt if we find any mismatches. Friday, February 10th 2017 was Martin Millerï¿½s last day in the office. For over 20 years, Martin answered requests and wrangled a variety of plant and animal data into MTNHP databases. Martin started as a volunteer at MTNHP, but soon worked himself into a paid position. His tenure with the program encompassed major technological advancements. In his early days, computerized Geographic Information Systems were just becoming accessible, and the program was still plotting Element Occurrences on paper quadrangle maps using adhesive dots with notes in the margins. Soon Martin began entering observations into the newly created statewide Point Observation Database and eventually entered many tens of thousands of observations into this database. He also took the lead on answering mediated requests for MTNHP information and probably answered over 50,000 requests throughout his tenure. Big numbers also permeated Martinï¿½s personal life where he participated in over 75 ultramarathon events ranging from 50 kilometers to 100 miles in length. He plans to run even more in retirement! MTNHP thanks Martin for his wonderful service and wishes him the best in his ongoing adventures! The 2016 Montana Natural Heritage Program partners meeting was held in Helena on December 1st. Summary highlights and partner feedback from the meeting are below and you can access the Information Systems & Services, Botany, Ecology, Zoology, 2016 MTNHP Budget, and NatureServe Network Member Program Survey presentations from the meeting at the following links. The meeting was attended by 50 people from 20 different organizations. Organizations attending included: Bureau of Land Management, Department of Agriculture, Department of Environmental Quality, Department of Natural Resources and Conservation, Montana Fish, Wildlife, and Parks, Montana State Library, Montana State Library Commission, the Environmental Policy Office of Montanaï¿½s Legislative Services Division, University of Montana, Natural Resource Conservation Service, U.S. Army Corps of Engineers, U.S. Forest Service, U.S. Fish and Wildlife Service, Montana Audubon, Montana Association of Conservation Districts, Montana Land Reliance, Westech Environmental Services, Rocky Mountain Elk Foundation, and the Nature Conservancy. We had a few competing meetings and the USGS, Joint Venture, BIA, MDT, and LCC partners sent their apologies to the group. Around 3,300 mediated requests for environmental review information or the expertise of botany, ecology, or zoology staff. There are typically 10-15 mediated requests per average work day. Plant identification trainings by MTNHPï¿½s Program Botanist, Andrea Pipp in 2016 and interest in setting up trainings in 2017. 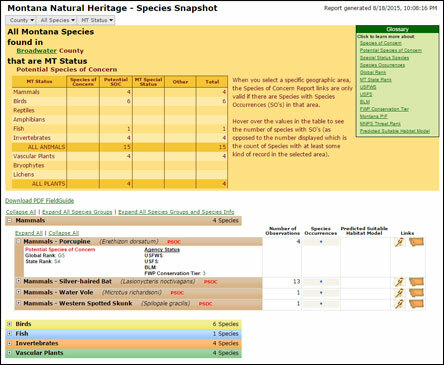 Use of the Species Snapshot http://mtnhp.org/SpeciesSnapshot/ to create portable customized field guide reports for a variety of spatial, taxonomic, and status filters. A full complement of spatial filters was added in 2016. Some partners are using these as appendices of environmental reviews. Development of the new Environmental Summary task in Map Viewer http://mtnhp.org/mapviewer/ that, for agency-level user defined polygons, provides summaries of species documented and potential present, structured surveys where a particular protocol was followed, acres of various wetland and riparian mapping polygons present, acres of various land cover types present, and lists of biological reports associated with observation data. Users can also download custom field guides of species that are documented or potentially present for Species of Concern, Potential Species of Concern, or all other status. Invasive species information is also included in these reports where present, but MTNHP has not managed invasive species information in the past and does not have staff time to do this given the programs budget which has remained static since 2008. The Environmental Summary report will be MTNHPï¿½s new standard for information requests starting in January of 2017 and a number of partners have expressed interest in including this report as an appendix to environmental reviews and working with MTNHP to create customized hierarchical versions of this report (e.g. Forest wide, each Forest District, and all 6th Code watersheds within each Forest District). New data processing standards implemented in 2016 that ensure that Species Occurrence polygons are updated quarterly so that users have access to all information in MTNHP databases that is of use in environmental reviews. The increased number of Heritage information resource trainings to MTNHP partners in 2016; approximately 25 trainings were conducted. Contact Bryce Maxell at bmaxell@mt.gov or 406-444-3989 if you or your organization could benefit from an updated training on MTNHP information resources in 2017. Development of Montana Field Guide species accounts for 360 mosses, 30 Bumble Bees, and nearly 100 of Montanaï¿½s 218 butterfly species. Updates to statewide wetland and riparian mapping for management and prioritization of a variety of conservation funding opportunities for those habitats. Of the 2,954 USGS Quadrangles that cover Montana, 2,426 (82%) have either been mapped or there is funding in place to get them mapped. There are still 528 quadrangles (18%) that need funding for mapping. These quadrangles are primarily composed of private, tribal, USFS, State, and National Park Service lands. Higher level derived products associated with the wetland and riparian mapping effort that identify wetland mosaics, wetlands of special significance, wetlands important to streamflow maintenance, and levels of wetland protection. Updating the 2016 Land Cover layer with the latest agricultural, road, structures, and fire perimeter information despite a lack of Montana Land Information Act funding to support this Montana Spatial Data infrastructure layer; one-time project funds were used to accomplish this. Addition of nearly 3,400 photos to species accounts on the Montana Field Guide; 1,170 species now have photos that previously did not have any photo representation. Addition of 4,386 literature references on Montana plant and animal species and biological communities to the MTNHP reference system which allowed 18,147 reference associations to be turned on in the Montana Field Guide for 5,113 species. MTNHPï¿½s program Botanist, program Ecologist, and Senior Zoologist for sharing their expertise and continuing to assist agencies with monitoring of species and habitats of concern through partner funded projects. Partners believe cost savings to individual partners from having information centralized at MTNHP is of a large magnitude; one or two positions, hundreds to thousands of hours, tens to hundreds of thousands of dollars are year were amounts reported by individual partners. Partnerï¿½s expressed interest in assisting MTNHP with conducting a return on investment study to identify how much time and funding MTNHP information resources save the state, individual partners, and the citizens of Montana. Partners that have contributed supplemental core funding in the past expressed that they have been satisfied with what they have received for their supplemental funding contributions and that they plan to continue those contributions in the future. MTNHPï¿½s budget has remained static since FY08 without any present law (cost of living) adjustments. Through 2016, this has resulted in a 31% reduction in the effective buying power of the funding over this time period. The Governorï¿½s FY18/19 budget did not include the funding requested to restore program funding to FY2008 levels in order to cover inflation, rising health care costs, mandated but unfunded salary increases, and the increases in the costs of Biotics software required to meet our statutory requirement to manage information in a compatible manner with Heritage Programs in other states (MCA 90-15-302). MTNHP has lost the Aquatic Ecologist position that partners rely on for expertise on nongame fishes and aquatic macroinvertebrates. MTNHP is at risk of losing remaining staff capacity to map wetland and riparian areas as wetland/riparian funding has dramatically decreased. MTNHP lost all Montana Land Information Act funding for updating and maintaining the Montana Land Cover layer in FY16 and FY17. Contractors donï¿½t have direct access to all MTNHP information via websites the way agencies do as a result of data sensitivity concerns from agencies. Funding limitations have resulted in a backlog of information that needs to be incorporated into MTNHP databases (e.g. many invertebrate and nonvascular plant species are not included in MTNHP databases, observation data for plant and animal species has not been entered, invasive species information). Montana Land Information Act funding from fees collected from document recordation has declined in recent years. However, funding to MTNHP in FY17 is expected to remain at or near the $10,000 available in FY16. The Digital Library recently reorganized into User Services, Information Management, and Information Products groups. The User Services group may assist with MTNHP information requests in the future in order to provide assistance with declining MTNHP budgets and provide one stop responses for information requests at the State Library. Data management differs by FWP region. Want to work out how to get FWP data into MTNHP databases more efficiently and consistently across all regions and interested in working with MTNHP on using Survey123 and iNaturalist to do this for FWP biologists as well as when working with the general public. Biologists have found the Species Snapshot very valuable in quickly creating customized field guides of documented species for a variety of spatial polygons. Continue to work on bat/cave and White-Nose Syndrome work with MTNHP and are also now collaborating with USGS on this. Use MTNHP predictive distribution models and have funded MTNHP to create models for Species of Concern and update the conservation status rank reviews on a number of Species of Concern. FWP staff learned a lot from MFWP offered trainings on shrub ID this past year. Perhaps there is an avenue for partnering with Andreaï¿½s Plant ID trainings in 2017. Working with MTNHP on identifying/defining survey effort that would be sufficient to feed into conservation status rank updates for the State Wildlife Action Plan and in particular for Species of Greatest Inventory Need. Will be working with MTNHP to update their MOU on data exchanges. MTNHP information trainings to regional staff have been very valuable, but may need another round of training for new Environmental Summary and other tools which area biologists may not realize are available. FWP fisheries staff misses Dave Staglianoï¿½s work on nongame fishes and macroinvertebrates because they donï¿½t have that expertise. Could start to get an idea of cost savings to FWP from MTNHP information by contacting staff in each region to discuss time savings. From what was presented today, ACOE probably greatly underutilizes MTNHP information resources and would be interested in a general training to staff. Very interested in plant identification training for staff. Wetland and riparian mapping summaries will save a lot of time. It is not an exaggeration to say that MTNHP data could save a large pipeline or transmission project with multiple potential sites, hundreds of thousands of dollars in high-level alternatives or fatal-flaw analysis because there is no need for on-the-ground data collection. Staff rely on MTNHP data, species accounts on the field guide, and literature presented in species accounts as a starting point for their environmental analyses. Staff use MTNHP information daily. Work with Heritage programs in numerous states and Montanaï¿½s data quality, accessibility, and organization are hands down the best. Regarding MTNHPï¿½s funding issues: Although free public information is appreciated, it is entirely appropriate for large-scale projects to pay for data. Donï¿½t blink an eye at a $100 fee in other states. A scaled fee for the size of the project is entirely appropriate. Maybe anything under 25 acres is free ï¿½ that would probably cover a lot of citizen-level requests. On the other end, maybe anything over 1,000 acres is $250 or so. Frankly the public is paying for these data through tax dollars funneled through agencies, but private corporations are not. To have well-organized, comprehensive data in a single data package is worth a lot more than $250 to any large project. One possible concern: does the level, depth, and organization of MTNHP data create the impression that field work is not necessary? Potential concern for a false sense of accuracy being created that, in the current climate of budget cuts, causes a biologist to say itï¿½s ï¿½good enoughï¿½ and not actually do any field verification. The landcover data, and frankly the MTNHP wetland data, are not based on much field verification and we can see a fair departure from field conditions with these data. This isnï¿½t meant as a criticism of the GIS data really, theyï¿½re the best available on a state-wide level no doubt. But perhaps stating error rates for mapping, etc. more upfront in the data presentation ï¿½ rather than in the metadata or somewhere similar ï¿½ might encourage people to go to the field for appropriate evaluations. While I appreciate data-sensitivity issues, it is a bit frustrating to see that the agencies can easily access data at MTNHP that private industry cannot. Ultimately, of course, we can get those data through mediated data requests and maybe thatï¿½s how it should remain. But the fact is, companies (at least large companies) want those data so they can avoid, minimize, or mitigate for the species in question. They arenï¿½t looking to go out and destroy habitat for the sake of destroying it. Maybe the current situation is the best compromise, but in the end, you have to know whatï¿½s present to avoid it and I have never worked for a company that didnï¿½t want to avoid, minimize, or mitigate once they know something was present. Could the current agency-level of access to information be provided to consultants after a data training to ensure they are using it correctly and are aware of data sensitivity issues? Amount of data available on MapViewer and Field Guide is extremely valuable for section 7 consultation work by USFWS. Funded and worked with MTNHP this past year to provide information for the USFWSï¿½s ECOS database and Information for Planning and Conservation (IPaC) website which is a project planning tool that streamlines the USFWS environmental review process and guides users toward issues they need to undertake section 7 consultations for. Provided $5,000 in supplemental core funding to MTNHP for the first time this year in order to provide up-to-date information to the ECOS database and IPaC website. Working with MTNHP on Northern Long-eared Bat (Myotis septentrionalis) surveys in the area were the species is listed as Threatened in eastern Montana. MTNHP created species accounts and range maps, acquired observations, and created predictive distribution models for Bumble Bees, including three that have been petitioned for listing: Western Bumble Bee (Bombus occidentalis), Suckley Cuckoo Bumble Bee (Bombus suckleyi), and Yellow-banded Bumble Bee (Bombus terricola). Hard to quantify the cost savings provided by MTNHP resources, but it is large! Really appreciate focus on wetland and riparian mapping. DEQ has adopted the ecological assessment methodology developed by MTNHP. We donï¿½t want to lose capacity for wetland and riparian mapping. DEQ has had a great experience with MTNHP products. Wondering if DEQ could contribute to supplemental core. Probably need to talk to DEQ at a higher level regarding trainings and data availability. George Mathieus was unable to make this meeting. MTNHP provided training on their information resources at a Montana Wetland Council meeting, but numerous DEQ staff may be unaware of MTNHP information resources. Looking at providing some funding for MTNHP to integrate data from recent coal mine monitoring reports into MTNHP databases. Will look into funding to have Andrea do plant identification trainings in 2017. The new Environmental Summary tool will be extremely valuable for Environmental Impact Statements and will save many hour of time for many DEQ staff. Plan to have MTNHP do an MTNHP information resources training to DEQ coal mine contractors. Wondering if some mid-level access could be provided to contractors given trainings in order to make sure they are using the same data that the agencies are for environmental reviews. MTNHP information resources blows other states out of the water in comparison to the environmental information they have available for planning efforts. Use Heritage data for open cut mines, coal mines and very happy with rapid response times. Working with MTNHP on bat acoustic monitoring at coal mines. Would be interested in working on a templated report along the lines of the Environmental Summary tool for use in DEQï¿½s environmental reviews. It would be good to see more individuals from the restoration and mitigation community at MTNHP partnerï¿½s meetingsï¿½wetland mitigation banking folks for example. Updated wetland mapping is extremely valuable for compliance, permitting, and mitigation. All BLM staff are using MTNHP data and they rely on us. Would like to assist MTNHP on a return on investment study within BLM in order to better understand and quantify cost savings, but MTNHP resources are saving positions/time/funding within BLM. Very happy with new Environmental Summary Tool in terms of the time/cost savings it will afford BLM. Would like to follow up with a meeting on standardized templated environmental summary reports as appendices to BLM environmental reviews and resource management plans. Have MTNHP information resources training scheduled for state BLM staff in January and will follow up with individual field offices as needed. Need plant identification trainings for permanent employees and Assessment, Inventory, and Monitoring teams. Would like to see more tribal and university involvement in MTNHP partners meetings in the future. Have a new Geospatial Ecologist at the BLM state office and need to have her meet with MTNHP staff. Concerned about erosion of MTNHP abilities from static core funding resulting in data entry/processing backlogs. Valuable for them to see MTNHP products and here directly from users of MTNHP information resources. May want to look for outside assistance with development of Survey123 forms/applications. Use of Survey123 could result in very precise record collection. A new $300 antennae for cell phones comes out soon with centimeter accuracy. Have used Heritage program data in 7 other states and MTNHP information resources are far ahead of other states. Having status ranking sheets on the field guide for all species and habitats would be very valuable for USFS planning process since it starts with state conservation status ranks. The ranks are readily available, but seeing the underlying scoring shown on the full status ranking sheets would be very valuable. Will follow up with MTNHP on some ideas on cost savings to the USFS from MTNHP information resources in USFS planning processes. Rely on MTNHP resources more and more as USFS shrinks in size. Forest Plan Revision efforts are ongoing ï¿½ 3 going on in Montana right now. These include the Flathead National Forest, Helena-Lewis and Clark, and Custer-Gallatin. Ecosystem sustainability is a key focus of all forest plan revisions. Species of Conservation Concern are the focus. Recently had a training on MTNHP information resources at the Region 1 office and Bryce will be following up with trainings to individual forests as needed. Have initiatives on invasive plant species and invertebrate pests. Work closely with DNRC and MSU for surveillance of these species. Worked with MTNHP on bumble bee data upload. MTNHP created species accounts and predictive distribution models for all Bombus species in Montana. Would like to see MTNHP develop accounts and models for Wood Boring beetles and Asian Longhorn Beetles. Agency concern about pesticide impacts on native species and MTNHP information helps avoid impacts to native Species of Concern. It would be helpful to have invertebrates in Montana Fish, Wildlife, and Parksï¿½, State Wildlife Action Plan (SWAP) so that invertebrate efforts could qualify for more federal funding assistance. Will follow up with MTNHP on sensitive habitat assignment for preventing accidental pesticide/herbicide kills. Drift Watch. Use MTNHP data in Noxious Weed Trust Fund grant application process. MTNHPï¿½s new Environmental Summary tool should be of great value to this. Each year get 25-40 grant applications; getting fewer applications because environmental reviews are difficult. Would take Department of Ag a huge amount of time to review applications without MTNHP information resources so this is a big cost savings to the agency. It would be valuable to have MTNHP do information resource trainings to weed spray applicators in the fall and spring. Noxious weed trust fund has contributed supplemental core funding under the educational category of the Noxious weed trust fund for many years and for the last two years has contributed supplemental core funding under both the educational and research categories. MTNHP provided an information resource training to NRCS employees in May and is scheduling webinar trainings for field offices on the new Environmental Summary tool over the next three months. NRCS works heavily with tribal and private land owners and may be able to partner with MTNHP on filling in data gaps on those lands. It would be nice to see more tribal and BIA representation at MTNHP partnerï¿½s meetings. Really appreciates overview of Heritage data resources and excited about the new Environmental Summary tool. Has supported MTNHP with supplemental core funding since 2006 (except for 2014) and will try to continue that support. Would like to continue to work with MTNHP on adding background data to Map Viewer that is relevant to NRCS employees. Has worked with MTNHPï¿½s Spatial Analysis Lab staff to get Landsat imagery ready to use and that information can be shared with others that are interested in using it. There is a huge need to have the statewide Land Cover layer, one of Montanaï¿½s 15 Spatial Data Infrastructure layers, updated. Need MLIA funding and a revitalization of the Land Cover working group to do this. MTNHP data is key to environmental planners who may not have any wildlife or plant background. Use MTNHP GIS data on a daily basis. TNC would need 1-2 additional staff without MTNHP information resources. Looking forward to an MTNHP information resources training to TNC staff in the new year. Would love to see a national crosswalk of data from Heritage programs in all states and Canadian provinces, especially for those immediately adjacent to Montana. Really likes have predictive distribution models for species in Map Viewer and is excited about the new Environmental Summary tool. Would like to talk over conifer encroachment issues with partners. Use MTNHP data, like the field guide, species snapshot reports, and predictive distribution models, for fundraising and in working with land owners. Use MTNHP data for organizational assessments ï¿½ acres of habitat protected and where to focus efforts. The question about the value of MTNHP data is a hard one. Unfortunately, if it wasnï¿½t available, we wouldnï¿½t have time/resources to create it ourselves and we would be a lot less informed in our decision making. Use MTNHP data in project reviews and grant applications. It would be valuable to have trainings on MTNHP information resources. It is very nice to see the Important Bird Areas as a spatial filter in the Species Snapshot for working with Audubon members. Have been using MTNHP predictive distribution models for a number of species on several focal projects of Audubon. It is very valuable to have the survey location information tracked and summarized in the new Environmental Summary tool and the older Surveys tool for planning future survey efforts. Thinking that a number of Audubon members likely have a lot of data that they could be submitting to MTNHP. The new Environmental Summary tool should be very valuable for all environmental reviews. Thanks for providing option to list birds taxonomically or alphabetically by common and scientific names. MTNHP data is probably greatly underutilized by soil and water conservation districts. Would like to work with them and MTNHP to figure out the best way for them to use this information. Need to collaborate with MTNHP on tribal, county, and local government contacts to provide them one-stop-shopping for State Library GIS resources. Should work with agencies to insert standard language in the RFPs that requires applicants to use MTNHP data and NRIS data where appropriate and that they should submit data gathered during the course of their projects to MTNHP where appropriate. Next National Agricultural Imagery Program (NAIP) imagery for Montana will be 1 foot resolution and is scheduled for 2017. Need to present MTNHP information resources at GIS conferences inside and outside Montana. The return on investment completed for the Montana Cadastral layer may be a good model for an ROI on MTNHP information resources. The Milton Ranch north of Roundup was crawling with botanists on the cool, wet, third week in September. Bill and Dana Milton hosted and fed the high-powered group that was assembled by Andrea Pipp, the program botanist for the Montana Natural Heritage Program in Helena. Pipp applied for and received grants from the BLM and the Montana Native Plant Society to fund the team's travel expenses, while they donated their time and expertise to compile the first inventory of lichens and mosses in Musselshell County. Visit the new wetland status map at the link below to see the changes we've made. In addition to up-to-date information on completed and in-progress mapping from MTNHP, the status map breaks down NWI maps from the Fish and Wildlife Service into "outdated" mapping from the 1980's and "incomplete" mapping, a recent effort that involved digitizing old topo maps. We've also created a PDF that explains the different categories of mapping and allows you to compare exactly what each type of mapping looks like for a given area. You can find the PDF link on the status map page or use the link below. MTNHP is pleased to welcome Dan Bachen as our new Senior Zoologist. Dan received his B.S. in Wildlife Biology from the University of Montana and his M.S. in Fish and Wildlife Management from Montana State University. Dan has worked for the Montana Natural Heritage Program for several years in the past. For example, he led field crews in our statewide Diversity Monitoring baseline surveys for amphibians, reptiles, small terrestrial mammals, and bats for Montana Fish, Wildlife, and Parks. He has conducted surveys for Northern Goshawks and terrestrial mollusks in our projects for the U.S. Forest Service and Bureau of Land Management. He was the project manager for our first ever baseline wildlife survey for grassland birds, small terrestrial mammals, amphibians and aquatic reptiles, and bats for the South Dakota Field Office of the Bureau of Land Management. More recently, Dan has been working for the U.S. Geological Survey managing relational databases of several million records for a large regional elk and brucellosis study. Dan brings broad taxonomic experience and interest and solid statistical, database, GIS, and writing skills to the Senior Zoologist position. He is very excited to join our team at the Montana Natural Heritage Program and I know he will bring a lot of energy to the position. Dan will be joining us May 2nd, 2016. The Seasonal Field Botanist will be primarily working individually or as a team member to assist in MTNHP ecology field projects throughout Montana, although some office work in Helena may be required. Principle duties include 1) leading a vegetation sampling team in wetlands in both the Rocky Mountains and the Great Plains of Montana; 2) assisting in various duties related to the National Wetland Condition Assessment. MTNHP is pleased to welcome Jennifer Chutz as our new Ecologist/Projects Manager. Jen is a wetland and wildlife ecologist with 10 years of experience in natural resource management, monitoring, and applied research. Most recently, she has operated her own consulting company, while working as a summer wetland ecologist and field botanist for MTNHP. Previously she worked as a wildlife biologist with the U.S. Forest Service where she focused on land-use impacts on natural resources and species of concern in the Greater Yellowstone Ecosystem. During her Master's project at South Dakota State, she supervised and conducted field surveys of endangered and migratory waterbirds, aquatic invertebrates, and vegetation in a farmed wetland setting in Hawaii. The Montana Natural Heritage Program has released its Strategic Plan for July 2015 through June 2020. The Scope of Work contained in the biennial contract between the State Library and the University of Montana is revised every two years. That Scope of Work is directed by this Strategic Plan and will reflect its implementation. The Montana Natural Heritage Program is the state's source for reliable information and expertise to support stewardship of our native species and habitats, emphasizing those of conservation concern. Our vision is that public agencies, the private sector, the education sector, and the general public will trust and rely upon MTNHP as the source for information and expertise on Montana's species and habitats, especially those of conservation concern. We strive to provide easy access to our information in order for users to save time and money, speed environmental reviews, and inform decision making. We endeavor to be a single statewide source of accurate and up-to-date information on Montana's plants, animals, and aquatic and terrestrial biological communities. We actively listen to our data users and work responsively to meet their information and training needs. We strive to provide neutral, trusted, timely, and equitable service to all of our information users. We make every effort to be transparent to our data users in setting work priorities and providing data products. MTNHP is recruiting a Senior Zoologist in our Helena, MT office. Principle duties include: (1) designing, securing funding for, and conducting inventory and applied research on priority species and habitats; (2) leading animal species status ranking for Montana; (3) coordinating the collection and management of statewide biological data in tabular, spatial, and image formats; (4) contributing to conservation and management planning; (5) building collaboration among agencies, biologists, and data contributors; (6) developing reports, posters, technical publications, and web pages; and (7) answering zoological related data requests, and providing expertise to resource managers and decision-makers. This position is full-time with benefits, and is renewable annually based on funding and performance. The Senior Zoologist reports to the MTNHP Program Coordinator and works closely with the Ecology and Botany Program Managers, database, GIS, and web specialists, and public and private partners to acquire and disseminate information on Montana's animal species, with an emphasis on species of conservation concern. S/he supervises permanent and temporary employees and contractors as needed. Graduate degree in zoology, wildlife biology, or related field and 3 to 5 years relevant professional experience or equivalent combination, including demonstrated proficiency in field inventory, monitoring, research design, sampling methods, and data analysis. Knowledge of the animal species and habitats of Montana and the principles of applying scientific information to on-the-ground conservation and management. Demonstrated ability to secure funding for inventory and status assessments of animal species. Proven ability to express ideas clearly and concisely in oral, written, and graphic form. Proven ability to assemble and organize scientific data, undertake statistical analyses, and prepare reports of findings. Demonstrated experience in MS Outlook, Word, Excel, Access, and ArcMap, with ability to produce reports. Demonstrated experience with developing, populating, and querying relational databases. Ability to use advanced computer functions and to manipulate, analyze, and interpret data. Knowledge of current research and management trends in the fisheries and wildlife biology. Supervisory experience, including ability to motivate, lead, set objectives, and manage performance. Successful experience in developing and managing budgets, directing employees, and contracting work for multiple projects simultaneously. Application review will begin on January 15, 2016 and will continue until the position is filled. Questions regarding the structure and function of the position can be directed to Bryce Maxell at bmaxell@mt.gov. Questions regarding the search or online application process should be directed to the UM Recruitment Team at the University of Montana via email at staffjobs@mso.umt.edu. Criminal Background Investigation is required prior to Offer of Employment. In accordance with University policy; finalists for this position will be subject to criminal background investigations. ADA/EOE/AA/Veteran's Preference Reasonable accommodations are provided in the hiring process for persons with disabilities. For example, this material is available in alternative format upon request. As an Equal Opportunity/Affirmative Action employer, we encourage applications from minorities, veterans, and women. Qualified candidates may request veterans' or disabilities preference in accordance with state law. References *References not listed on the application materials may be contacted; notice may be provided to the applicant. Testing Individual hiring departments at UM-M may elect to administer pre-employment tests, which are relevant to essential job functions. Employment Eligibility. All New Employees must be eligible and show employment eligibility verification by the first date of employment at UM, as legally required (e.g., Form I-9). The 2015 Montana Natural Heritage Program partners meeting and 30th Anniversary celebration was held at Montana Wild in Helena on December 7th. Minutes from that meeting are below, the MTNHP's Strategic Plan for 2015-2020 can be accessed at mtnhp.org/docs/2015_2020_Strategic_Plan.pdf and you can access the Botany, Ecology, Zoology, Information Systems & Services, and Budget & Strategic Plan presentations from the meeting on the internet at the following links. See Botany, Ecology, Zoology, and Information Systems and Services presentations for updates and future directions. Development of a new Environmental Review Information summary tool that would allow users to submit a shapefile or digitize project boundaries of interest for a report containing a list of documented species, a list of potential species, a summary of acreages of land cover types, a summary of acreages of wetland/riparian types, a summary of land management, a summary of biological reports in the area that are on file at MTNHP, and custom field guides of potential/documented species. Development of Montana Field Guide species accounts and other compilation of information for species recently petitioned for ESA listing, nonvascular plants with no current representation in Heritage databases, and pollinators (bees and butterflies to start with, but wasps, moths, and ants that are pollinators as well). Completion of recent statewide wetland and riparian mapping for management and prioritization of a variety of conservation funding opportunities. Of the 2,952 USGS Quadrangles that cover Montana, 2,406 (82%) have either been mapped or there is funding in place to get them mapped. There are still 546 quadrangles (18%) that need funding for mapping. These quadrangles are primarily composed of private, tribal, USFS, State, and National Park Service lands. Updating the Land Cover layer to assist with implementation of the Greater Sage-Grouse Habitat Conservation Programï¿½both for the habitat disturbance and habitat quality tools. MTNHP's continued assistance to agencies with monitoring of species and habitats of concern through partner funded projects. Partners that have contributed supplemental core funding in the past universally expressed that they have been satisfied with what they have received for their supplemental funding contributions and that they plan to continue those contributions in the future. MTNHP was not able to continue to maintain an Aquatic Ecologist position, and more broadly that the lack of legislative funding to the Montana State Library continues to hinder MTNHP's ability to retain staff expertise, and develop and maintain core information and services at the level that seems to be intended by statutes that guide the program. MTNHP is at risk of losing staff capacity to map wetland and riparian areas as wetland/riparian funding has tapered off. MTNHP lost all Montana Land Information Act funding for updating and maintaining the Montana Land Cover layer in FY16. Reduce a backlog of requests and keep it from re-occurring. Funded nongame biologist positions in all 7 FWP regions from a cobbling together of a variety of funds. Trying to integrate game and nongame surveys and staff as much as possible. 2015 State Wildlife Action Plan is official and has been released. The SWAP incorporates the SOC list and SGIN list as its method of evaluation of conservation and status survey updates. FWP wants the following from MTNHP: data to make management decisions, assistance with information on petitioned and listed species such as Northern Bog Lemming and Northern Myotis, prioritizing SOC, and distribution data to work with developers on mitigation. MTNHP is very useful for hiring seasonals through UM since FWP doesn't always have FTE hiring authority, but has funds. Wants to have automated request filler along the lines of the Environmental Review Tool presented. Trainings to regional staff have been very valuable. Species expertise is very helpful to FWP. USFWS is looking for status information on invertebratesï¿½especially pollinators. Online references are valuableï¿½push for best available science. Maxent modeling for addressing listing decisions and conservation initiatives (Long-billed Curlew initiative). Need a more detailed sagebrush map. Field Guide custom report has been very valuable. They miss Dave Stagliano's work on nongame fishes and macroinvertebrates because they don't have that expertise. Need to update MOU on data exchange. Have reached a verbal understanding of how to exchange data on Greater Sage-Grouse moving forward. State is following Wyoming's Density Disturbance Calculation Tool approach for implementation in Montanaï¿½DNRC is implementing this starting in Januaryï¿½project cannot disturb more than 5% of available Greater Sage-Grouse habitat in the area. Habitat exchanges will be possible under Greater Sage-Grouse conservation plan. FWP will monitor Greater Sage-Grouse. Executive order has oversight committee at Director level. Need to see where Heritage can crosswalk with various arms of USFWS. Jodi will help us crosswalk with National Wildlife Refuges and USFWS research staff. Insect and aquatic invertebrates are coming up for listing decisions. Northern Bog Lemming, Royal Fritillary, Western Bumblebee are all up for listing decisions. Review of Canada Lynx status is upcomingï¿½review to see if they are going to engage in recovery planning. Greater Sage-Grouse was not warranted for listing. Looking at implementation of conservation efforts. Another status review is likely in 3-5 years in order to track success of conservation efforts. Natural resource damage assessment on Yellowstone River oil spills may be an avenue of crosswalk with MTNHP. Need a cavity nester assessment in riparian areas and assessment of oil spill impacts along those lines. Worked with MTNHP to create polygons that will be used in the USFWS Information for Planning and Conservation (IPAC) website which will guide users on where they need to undertake consultation with USFWS. Working with TNC on statewide Candidate Conservation Agreement for Greater Sage-Grouse. The return on investment of Heritage data is huge for BLM since it would require huge amounts of funding to create these information resources if they had to do it on their own. BLM intends to continue to provide supplemental core funding at levels similar to their contributions in recent years. Trainings and web trainings are something they are very interested in because of retirements and new employees. Environmental review tool is definitely something they are very interested in. Would like to be able to submit a shapefile and then buffer it by various distances. Greater Sage-Grouse is a game changer for BLM. BLM will be using disturbance tool in conjunction with FWP and DNRC. Focused on conservation actions that maintain and conserve sagebrush. Had 4 recent RMPs and 2 amendments to RMPs that utilized MTNHP data. Will have some directed funding toward burning or mechanical removal of trees that are encroaching on sagebrush habitats. Heritage can help figure out what potential impacts might be on a wide variety of species in those sagebrush/savanna ecotones. Have a couple of new fish bios. Have increased need for understanding prairie streams. Also miss the expertise of Dave Stagliano to address prairie fish data gaps. Want to stop expansion of Northern Pike in prairie streams. Have been involved with bat and cave surveillance efforts so far and plan to be involved with habitat-based acoustic sampling effort. Will continue to be a need to assess Northern Myotis distribution in SE Montana and South Dakota. BLM generates a Special Status list every 5 years. In 2014, BLM took a look at what Species of Concern actually overlap with BLM lands so that BLM could actually have an impact on management outcomes. Will need Heritage assistance with future revisions of BLM Special Status list. Wendy is only Botanist in BLM for MT, SD, and ND. May need to train Greater Sage-Grouse seasonals to identify and document forbs as part of their field work. Identify BLM plants of highest inventory need and then work with Heritage to conduct inventories. Wendy would like to work with Heritage on pollinator information compilation initiative. BLM has national guidance to consider pollinators when conducting revegetation efforts. Cara Staab, Region 1 Wildlife Ecologist, was unable to attend this meeting, but will coordinate USFS's annual funding contribution to Heritage. USFS supplemental funding contribution to MTNHP looks very stable moving forward. Historical perspective from the days when Steve Shelly was a Botanist with MTNHP shows how far we have comeï¿½very impressive. Rely heavily on Heritage information resources, conservation status ranks, and species occurrences and observations. Monitoring efforts must continue in order to assess ongoing status of Species of Conservation Concern. Will support funding of the Integrated Monitoring by Bird Conservation Regions (IMBCR) again this year. Have 5 million acres of White-bark Pine on USFS lands in Region 1 so Whitebark Pine information/mapping is critical. Need to know where to focus restoration efforts. Really value Heritage assistance with acoustic monitoring of bats and surveillance of caves. Would definitely like to crosswalk on training needs. Really appreciates overview of Heritage data resources. Has supported MTNHP with supplemental core funding since 2006 (except for 2014) and will try to continue that support. The State Conservationist, Lisa Coverdale, was pleased by the availability of information resources when she met with MTNHP in 2015. Charged with implementing the Farm Bill. Would like to implement a Heritage information resources training program for NRCS employees this coming year. Interested in seeing Frost Free Days, Growing Degree Days, and REAP layers in MapViewer as underlying base layers that other data could be viewed in the context of. Happy to continue partnership with Heritage and implement a training program for NRCS employees. Use Heritage data daily and it is invaluable to them. Need wetland data for wetland conservation and mitigation efforts for highway projects. Has budgeted supplemental core funding from MDT and it is not questioned because it is needed. Anticipates continued contribution of supplemental core funding. Have a good relationship with Heritage folks and they are responsive when there is something wrong in their databases. MDT finds it very hard to be responsive to Sage Grouse Executive Order when they won't know exact location of leks under new approach to exchange of Greater Sage-Grouse lek data from FWP to Heritage. Didn't initially think their projects would be impacted by Greater Sage-Grouse Executive Order, but have had to adjust some projects as a result of it. Starting point for environmental reviews is always Heritage and new Environmental Review tool will be very valuable to MDT. Missing a training for MDT consultants on how to use Heritage information. A training to MDT consultants would reduce the workload for consultants and would reduce work for MDT Environmental as well. Would like to give us mile marker layer to get it incorporated in MapViewer. Bill can facilitate this if it isn't already available in the state transportation layer. Noxious weed trust fund has contributed supplemental core funding under the educational category of the Noxious weed trust fund for many years and last year contributed supplemental core funding under both the educational and research categories. Work closely with DNRC and MSU for surveillance on pest species. MSU collection has 3 million specimens. Could work on integrating www.mtent.org invertebrate species lists into our Field Guide representation. Ian will provide guidance on how to work with MSU. Could link to pest control bulletins on the Montana Field Guide where appropriate. Would like to see BIA contribute toward supplemental core funding. Would like to see BIA contribute toward wetland mapping completion. Working with Kristy Bly at WWF on Black-footed Ferret and Black-tailed Prairie Dog reintroduction efforts. Mostly dealing with NEPA review and measuring distances to known habitat. MTNHP should work on MOUs of understanding with tribes on data exchanges. Merging with Weyerhauser and will be called Weyehauser. Will be the largest private land owner in the country at 13 million acres. Has supported MTNHP with supplemental core funding and with lobbying in the Montana legislature. Forest land owners certify their forest management practices under the Sustainable Forest Initiative and this adds value to their timber. Works across 18 states and the Heritage Program in Montana is the best that they deal with. Has collaborated with Heritage on bat acoustic monitoring and Plum Creek has convinced Stimson and Stolz timber companies to install acoustic monitoring devices on their lands as well. Helped connect Heritage with the SFI implementation committee and Montana Forest Land Owners in general; Heritage has given presentations to the Montana Forest Council, Montana Wood Products Association, and to timer land owners that attended the Montana Forest Land Owners Conference in Helena in 2015. Also helped connect Heritage with the Montana Wood Products Association for lobbying in support of the Heritage program in the Montana State Legislature. Need stream information for climate resiliency. Water volume for people and agriculture. On land side, the half million dollar conservation fund for Greater Sage-Grouse may be a possible source of funding for land cover layer for use in the disturbance and habitat quality tools. TNC will have a variety of land conservation easement projects that he may be able to build Heritage into. Need to crosswalk with Elaine from Montana Association of Conservation Districts. Really appreciate focus on wetland and riparian mapping. We don't want to lose capacity for wetland and riparian mapping. Would like to see more effort with how to hold water on the landscape, especially along the lines of beaver reintroduction. Would like to talk with us about what Heritage will put in for on the next EPA wetland grant program grants cycle. Need outreach to conservation districts, water districts, Montana Association of Planners. Has really appreciated bat trainings and bat acoustic monitoring. Would like to point out that DEQ mine program has been working on sagebrush restoration on coal mine restoration efforts for decades now and there may be lessons they have learned in those restoration efforts that would be of assistance to sagebrush community restoration efforts. Need to crosswalk veg and wildlife data gathered on coal mines with MTNHP. Did this in the past with wildlife data. Need to provide training and guidance to consultants so that data is more likely to be used in an appropriate manner. Has received Greater Sage-Grouse Point data from FWP in a timely manner recently. Use Heritage data to identify project needs and value of projects in order to get funding for conservation easements. Training for land trusts in how to use Heritage data would be of great interest. Would like to see bird data taxonomically listed on websites as well as in alphabetic order. Has funding to contribute to development of an updated Long-billed Curlew model for the Long-billed Curlew conservation initiative. Wants to see all BBS and IBA data integrated into Heritage databases. I am pleased to announce that Bryce Maxell will begin his new role as the Program Coordinator of the Montana Natural Heritage Program on October 19. Bryce has a long history with the program beginning in 1996 when he served as a field zoologist. Bryce began his employment as the senior zoologist in 2005 and served as the interim program director from November 2009 through June 2011. In addition to his incredible depth of scientific knowledge, Bryce brings to this position a deep understanding of the importance of public access to information made available through the State Library and the value this access brings to MTNHP information in service to our partners. This knowledge and understanding, coupled with his unparalleled work ethic, yields great enthusiasm that Bryce has for the program and that he will bring to this new position. Allan Cox retired from the Lead Program Manager position with the Montana Natural Heritage Program (MTNHP) on October 1, 2015 to enjoy some well-earned travel and leisure time. Allan has always been a great champion of the MTNHP and the Montana State Library (MSL), and worked to promote access, sharing, and coordination of geographic information and technology. His daily presence at the Library will be greatly missed! Allan started at the MSL in 1987 as the first GIS Coordinator for the Natural Resource Information System (NRIS), a unique program that provides for the acquisition, storage, and retrieval of data relating to the natural resources of Montana. Allan worked to obtain funding from state agencies to establish the NRIS GIS Program by promoting the value of NRIS in providing spatial data to those agencies and to the public. In 1992 he became the Director of NRIS and served in this capacity until 1998. Under his direction, NRIS became a nationally recognized GIS program. During this period Allan also became a founding member of the National States Geographic Information Council (NSGIC) and served on several committees and working groups promoting GIS activity and coordination, both in Montana and nationally. In 1998 Allan left the MSL to pursue other work. As a private GIS consultant he provided mapping support for wildfire incidents and also served as the Program Manager for the Montana Census and Economic Information Center (CEIC) at the Montana Department of Commerce. Allan returned to the MSL in 2001. Sue Crispin, then MTNHP Director, recruited Allan as the Systems and Services Program Manager for the MTNHP, a program under NRIS. In this capacity, Allan oversaw the development of innovative data systems to support the management and dissemination of information on Montana's biological resources. NatureServe, the coordinating organization of the international Natural Heritage Network, recognized this work with Technological Achievement awards in both 2006 and 2015. Allan also worked tirelessly to promote the mission, activities, and services of the MTNHP to users, partners, and decision makers. Allan took over the leadership of the MTNHP in 2012 as Lead Program Manager. In this role he oversaw all MTNHP activities, including scientific, informational, budgetary, and outreach. His vision and leadership have set the stage to promote the long-term viability and success of the MTNHP. Allan's passion for incident support continues to this day: he continues to serve as a volunteer EMT and Firefighter for the Montana City Fire Department, and gives time to working with fire professionals to ensure their use of the latest mapping technology to meet the wildfire challenges in our region. We will greatly miss Allan's insight and innovation at the MTNHP. We wish him all the best in his retirement! Friday, August 21, 2015Coefficient of Conservatism Rankings for the Flora of Montana: Part I.
Coefficient of Conservatism Rankings for the Flora of Montana: Part I. Species and land conservation requires the ability to assess natural areas. The Floristic Quality Assessment Index (FQAI) is a tool that uses plants to make standardized comparisons among open land areas, to set conservation priorities, to monitor project areas, and to restore habitats. The basic component of the FQAI is the assignment of a coefficient of conservatism (C-) value to individual plant species. For a given geography, C-values reflect the plant's tolerance to natural and/or human disturbance and its affinity to a specific, unimpaired habitat. For a given geography, the C-value reflects the plant species' tolerance to natural and/or human disturbance and its fidelity to a habitat, and is scaled from 0 to 10. Plants assigned a value of 0 are habitat generalists that respond positively to disturbance while plants assigned a value of 10 occur in very specialized habitats and are intolerant of disturbance. Full Report: Coefficient of Conservatism Rankings for the Flora of Montana: Part I. Take us with you! Field Guide PDFs are now compiled on-the-fly! 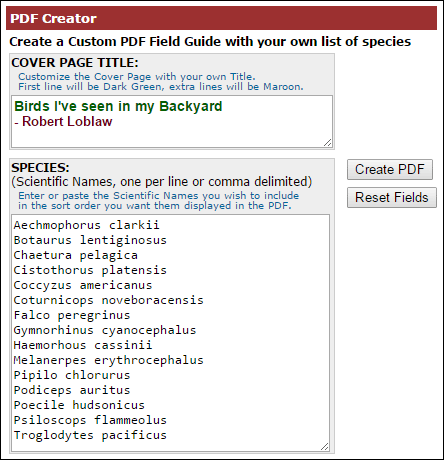 As you drill down through the lists, click the icon to download a custom PDF that includes all species for that level of Kingdom, Phylum/Division, Class, Order, or Family. You can even get a custom PDF from your Search Results! How cool is that!! Wetland and Riparian Mapping Center receives the 2015 Wetland Stewardship Award! Every two years, the Montana Wetland Council and the Montana Watershed Coordination Council jointly honor stewardship award recipients. The Montana Wetland Stewardship Awards recognize individuals and/or teams who exemplify excellence, innovation and extraordinary commitment in wetland protection, restoration, and conservation. The Montana Watershed Stewardship Award recognizes innovative, locally led approaches to restoring and enhancing Montana's watersheds. The Montana Natural Heritage Program and the Montana Wetland Council are pleased to offer five 1-day wetland plant identification workshops in 2015. These field-based workshops will be offered free of charge to attendees. The target audience includes: biologists and managers from federal, state, and tribal agencies, non-profits, local government planners, private consultants, and others who work with wetland vegetation and issues of wetland management. The courses will be designed to provide the basic skills required to identify Montana's common wetland plant genera (Carex, Juncus, Salix) and species, including invasive plants, and will be tailored to accommodate the plants common to the geographic area of the individual workshop. The level of detail presented will also vary based on the knowledge and interest of participants at each workshop location. Information related to the biology and ecology of individual wetland plant species may be covered. Each workshop will be limited to a maximum of 20 participants and will be filled on a first come, first serve basis. To register online, click one of the links above. To register by phone, call 406-444-4643. Participants should expect to travel to one or more wetland/riparian field sites within the vicinity of the workshop location. Participants will be responsible for their own transportation to and from field sites. Carpooling will be encouraged. Participants should wear appropriate field clothing and plan on bringing their own lunch and water. Additional details including meeting location will be provided to registered participants prior to each workshop. These training opportunities are being offered in part from funding by an EPA Region 8 Wetland Program Development Grant to the Montana Department of Environmental Quality. Andrea Pipp is the State Botanist for the Montana Natural Heritage Program located in Helena. Her botanical experience began in 1985 and over the years has encompassed learning about vascular plants, mosses, liverworts, and lichens. Working for federal agencies (U.S. Forest Service & Bureau of Land Management), private business, and the Institute of Ecosystem Studies, Andrea has conducted plant surveys, mapped vegetation communities, monitored species and wetland development, and performed plant studies. She has taught plant and lichen classes at the University of Montana and Carroll College, as a consultant, and for the Native Plant Society. During her 14 years as a consultant, most of her work focused on wetlands. She has extensive experience in wetland plant identification, delineation, and preliminary jurisdictional determinations. She has worked on wetland and stream restoration and designed and implemented monitoring projects. She is excited to teach these one-day, field oriented classes to people who want or need to know their wetland plants. For questions or additional information concerning these workshops please contact Lynda Saul at 406-444-6652 or lsaul@mt.gov or Andrea Pipp at 406-444-3019 or apipp@mt.gov. 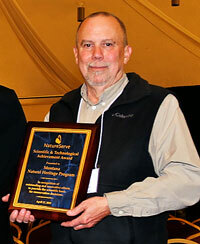 Montana Natural Heritage Program receives 2015 Scientific & Technological Achievement Award! We were proud to receive this award. It is a fitting reflection of the creativity and dedication of all of the folks who work at MTNHP. The award was primarily for our work in making our information more widely available, especially through our new web app the Species Snapshot. This new application provides a quick way to get a species list for your area. 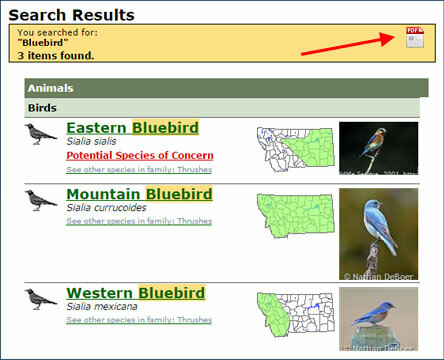 View species lists filtered by County, House/Senate District, BLM Field Offices, Forest Boundaries, FWP Regions and Townships. Data include the number of observations and species occurrences (SO's) for each species found in that area. Heritage scientists Dave Stagliano and Bryce Maxell contributed to a research article to be published in the Aquatic Invasions Journal. Abstract The American bullfrog (Lithobates catesbeianus) is a globally distributed invasive species that was introduced to the Yellowstone River floodplain of Montana. Knowledge about floodplain habitat features that allow for bullfrog persistence and spread will help identify effective control strategies. We used field surveys in 2010, 2012 and 2013 to describe bullfrog spread in the Yellowstone River floodplain and the habitat features that are associated with bullfrog occupancy and colonization. Bullfrogs in our study area expanded from ~ 60 km in 2010 to 106 km in 2013, and are spreading to up- and downstream habitats. The number of breeding sites (i.e., presence of bullfrog eggs or larvae) increased from 12 sites in 2010 to 45 sites in 2013. We found that bullfrogs were associated with deeper waters, emergent vegetation and public-access sites, which are habitat features that characterize permanent waters and describe human-mediated introductions. Control strategies that reduce the hydroperiod of breeding sites may help to limit bullfrog persistence and spread, while an increase in public outreach and education may help prevent further bullfrog introductions at public-access sites. We are pleased to announce that Andrea Pipp of Helena has accepted the position of Botany Program Manager for the Heritage Program. She began work with us on October 6th and is excited to join the Heritage team. Andrea earned a BA in Zoology (1989) and a MS in Wildlife Biology (1998) from the University of Montana. Her graduate study evaluated the independent effects of forest structure and forest age on the diversity and abundance of canopy lichens. Andrea's 28-year career has been spent working in the fields of botany and wildlife biology for the federal, state, tribal, and private sectors. Her expertise is in vascular plant (native/exotic), lichen, and bryophyte identification, surveying, and monitoring, wetland ecology, and technical writing. Her project work has focused on issues regarding forestry, stream and wetland restoration, transportation, residential, and oil/gas development in Montana and other western states. As the Program Botanist she wants to share her passion for Botany and Montana. Through leadership and collaboration Andrea's goal is to strengthen the collection, evaluation, data management, and dissemination of information on Montana's botanical species. She looks forward to working with agencies, academia, non-profits, resource professionals, and amateurs in providing services, acquiring information, and in teaching about botanical species. She invites you to share your ideas, needs, and/or botanical interests with her. Our newest version of MapViewer has been rolled out. This version will eventually replace Tracker, which has been our primary mapping application since 2005. This version features cached tiles, independently stacked map layers which allow you to turn them on/off without requiring a complete map redraw, new Add Observations pages with the ability to attach a photo to your submitted observations, and an overall faster map display. The Montana Natural Heritage Program (MTNHP) is creating maps of wetlands and riparian areas across Montana following USFWS NWI mapping standards. This ongoing effort has resulted in the most comprehensive, up-to-date mapping database for wetlands and riparian areas in Montana. This two-hour training, presented by the DEQ Montana Wetland Council, will show you how to easily access the mapping, including viewing the mapping in the MTNHP online Map Viewer, accessing it through an online map service, and downloading the mapping for use in a GIS. The Montana Natural Heritage Program has collaborated with Montana Fish, Wildlife, and Parks and members of the Montana Chapter of the Wildlife Society to create a new web page for online bibliographies on Fish and Wildlife Recommendations for Subdivision Development in Montana and the Effects of Recreation on Rocky Mountain Wildlife, both of which are tied to reports on these topics. These online bibliographies are now on the Heritage Program's website. The Montana Natural Heritage Program has released an updated edition of the Checklist of Montana Vascular Plants. Dr. Bryce Maxell, Senior Zoologist with the Montana Natural Heritage Program (MTNHP), was named ï¿½Wildlife Biologist of the Yearï¿½ by the Montana Chapter of the Wildlife Society last week at their annual meeting. 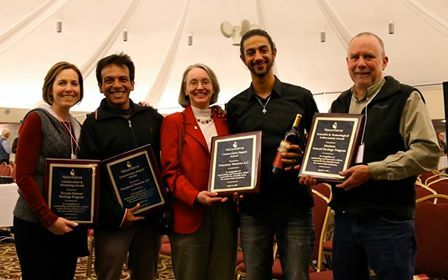 The Wildlife Society's awards program honors professional excellence, recognizes outstanding achievement, and highlights contributions to wildlife science and management. The Biologist of the Year Award is presented annually for significant achievements in wildlife conservation anytime during the five years immediately preceding the award presentation. Almost 75,000 acres of new (or previously undocumented) easements across the state have been added to the MTNHP Land Management Mapping Project's Conservation Easement feature class. New easements include the recently signed Nature Conservancy easement in Valley County near the Bitter Creek Area of Critical Environmental Concern, several new US Fish and Wildlife Service easements protecting wetlands and grasslands in Phillips County, and a large Montana Fish, Wildlife & Parks easement in the Kootenai region, protecting important timber, fish, and wildlife habitat. 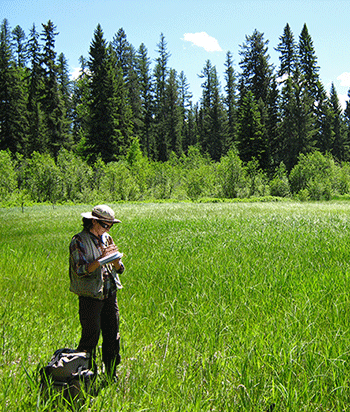 Karen Newlon published Southwest Montana Wetland Assessment. This report summarizes the results of our second basin-wide assessment of wetlands in the Upper Missouri Headwaters of southwestern Montana. Dave Stagliano follows Marshall's only documented route into the Bob Marshall Wilderness, focusing on the differences in landscape from what Bob Marshall saw back in 1928. MTNHP just released a new Checklist of the Birds of Montana. The checklist is current as of May 2012, with all 427 species observed in the state. It provides valuable information on both breeding and overwintering status, as well as, indicates the 104 species considered rare in Montana. MTNHP recently released its newest MapViewer toolset -- the Wetlands and Riparian Areas data for Montana. The new toolset allows users to view the most recently published and provisional wetland and riparian data for the state as well as the historical National Wetlands Inventory (NWI) data. Along with viewing the mapped wetlands and riparian areas, users may also run summary reports for watersheds of interest. Paul Hendricks, Zoologist with the Montana Natural Heritage Program, is featured in a recent Montana Fish, Wildlife and Parks "Montana Outdoors Report" video. The report focuses on Montana's native land mollusks. Most Montana rivers are well known to biologist, but in this outdoor report Winston Greely takes us to one Montana river that is just now being explored. The Montana Natural Heritage Program's survey of fish and bugs on the Powder River is featured in a recent Montana Fish, Wildlife and Parks Montana Outdoors video. An updated version of the Checklist of Montana Vascular Plants is now available. This revised version incorporates hundreds of status and taxonomic changes made in the past year, as well the addition and deletion of a few species to the list and the addition of summaries of the number of species by Family and Genus. Please welcome Dr. Neil Snow as the new Director of the Montana Natural Heritage Program (MTNHP) beginning July 1, 2011. Dr. Snow has achieved an international reputation in botany and taxonomy. He is enthusiastic about leading the program and forging strong working relationships with partner organizations. Dr. Snow spent many years in Colorado and Wyoming and has strong family ties to Montana. He is committed to the mission of the MTNHP and to meeting the needs of partners and the citizens of the state of Montana. The MTNHP has been well-served by Dr. Bryce Maxell the past 18 months while he served as both Senior Zoologist and Interim Director. Dr. Maxell's dedication to the MTNHP is greatly appreciated, and the zoology program will continue to be strong and robust with him at the helm. Special designated lands such as wildlife refuges, Research Natural Areas, wilderness, etc. Lands owned by land trusts or other private conservation oriented entities. The Montana Natural Heritage Program would like to announce that the most recent Land Cover data is now available online for download and as a Web Map Service. This new data set is a Montana-specific land cover layer modified from the Pacific Northwest ReGAP project classification from 30 meter resolution Landsat imagery. Descriptions of the land cover types can be found in the Ecological Systems Field Guide. This year marks 10 years of the State Wildlife Grant Program (SWG), federal funds distributed to states for surveys and management of nongame species. This national program is intended to prevent wildlife from becoming threatened or endangered and has greatly expanded our understanding of the distribution and status of a number of species in Montana. View a Montana Outdoors video about the SWG Grant Program in Montana. The Montana Natural Heritage Program is pleased to announce a series of webinars this winter to help our users make better use of our information and web services. To find out more or to register for one of the webinars, please email the instructor listed below with the webinar title and date you wish to attend. All session are free and will run approximately one hour. As of now, all webinars will use Go To Meeting webinar software. Audio will be handled via conference call. The conference call ID and phone number, instructions for installing the software and joining the meeting will be emailed to participants prior to the session. Date: Tuesday January 25, 1-2 p.m. Date: Tuesday February 15, 1-2 p.m. Date: Tuesday February 22, 1-2 p.m. Date: Wednesday March 2, 1-2 p.m. Date: Thursday March 3, 1-2 p.m. Participant Limit: 25 ** Please note: This session is available only to state and federal agencies. The Montana Natural Heritage Program recently released a new web application: the Natural Heritage MapViewer. The MapViewer is an interactive web mapping service that will, over time, enable users to perform a variety of tasks to access and use MTNHP databases and information. This first release includes tools to view and query the new Montana landcover data with ties-ins to the Ecological Systems Field Guide, and tools to access and view over 12,000 geo-reference habitat photos for Montana. In 2008, the Montana Natural Heritage Program was awarded an EPA Wetland Program Development Grant to develop a statewide network of herbaceous reference wetlands. The project focused on Montana's herbaceous wetland ecological systems. At each site, we conducted a Level 2 rapid assessment that evaluates the general ecological condition of individual wetlands using field indicators and identifies specific stressors that correlate with wetland condition. At a subsample of wetlands, we also conducted Level 3 intensive vegetation assessments to gather quantitative data that can be used to validate rapid wetland assessments, characterize wetland condition, and diagnose causes of degradation. Wetland assessments were conducted during the summer of 2008 and 2009. The Montana Natural Heritage Program has released the 2010 version of its Land Stewardship Maps. These maps are produced from its Land Stewardship Mapping database. The 102 maps are based on the US Geological Survey 1:100,000 scale topographic map series and use those boundaries as the indexing tiles. The maps are intended to display an overall picture of land management. The maps are not intended as a legal representation of public or private land boundaries. All maps are provided in Adobe PDF format. The maps are designed to be printed at a size of 36 by 30 inches on a large format printer. You might have heard a lot about the "Bad" Aquatic Mussels trying to come into Montana, but in this Fish, Wildlife and Parks Outdoor Report, Winston Greely shows us how Wildlife Managers are helping our "Good" native mussels. The Montana Natural Heritage Program's Aquatic Ecologist, Dave Stagliano, is featured in the video. The Montana Natural Heritage Program has released updated Conservation Easement data for 2010 and created an on-line interactive map to display the easement information. The easements are part of the Montana Land Stewardship Mapping Program the MTNHP maintains. In addition to the conservation easements, other information, including the managed areas data were updated. The Montana Natural Heritage Program has posted its 2010 to 2014 Draft Strategic Plan. This draft plan has been developed by staff and program managers and covers major goals and objectives for the Botany, Zoology, Ecology, and Information Services programs between July 2010 and June 2014. The Montana Natural Heritage Program is excited to announce the availability of new wetlands data and maps for Montana. New maps of the wetland and riparian areas are now available for downloading from the Wetlands and Riparian Mapping Center. You may also view the progress status of the wetland mapping as well as download GIS wetlands data. In 2008, the MTNHP was awarded an EPA Wetland Program Development Grant to develop a long term rotating basin wetland monitoring and assessment program. The pilot project for the rotating basin assessment program took place in the Milk and the Marias watersheds located in north central Montana. A simple map and data retrieval web site was developed to provide access to the results. The Montana Natural Heritage Program (MTNHP) and Montana Fish, Wildlife, and Parks (MTFWP) are pleased to announce The Checklist of Montana Dragonflies & Damselflies brochure. With 53 dragonfly species and 29 damselfly species included, this checklist represents the most current information available for Odonates in the state. This checklist provides information on distribution, abundance and seasonal occurrence for each species. Hard copies of this brochure are available, free to the public, at the MTNHP office within the Montana State Library, as well as at the MTFWP HQ office in Helena. A digital version can be downloaded from the MTNHP web site at the link below. The Montana Natural Heritage Program is pleased to announce the publication of its 2009 Annual Report. The report summarizes program activities, data products, and data delivery highlights during the 2009 calendar year. The Montana Natural Heritage Program is pleased to announce the publication of A Checklist of Montana Vascular Plants. This initial list comprises over 2,500 species reported for the state of Montana and it is expected to be updated periodically as new information becomes available. The Montana Natural Heritage Program's bat detection work is featured in a recent Montana Outdoors Report. View the video on the Montana Department of Fish, Wildlife and Parks website. The Montana Natural Heritage Program is conducting a short survey of individuals who have recently received Species of Concern project reviews or data transfers from the Program. The survey is intended to gather basic information on the value and quality of the information and services you recently received. It is short and should not take more than a few minutes to complete. Proceed directly to the survey! The Montana Natural Heritage Program is pleased to announce a new Species of Concern (SOC) Report. This new on-line report replaces our previous Species of Concern web search as well as the printed Species of Concern reports. All of the narrative information found in the printed reports. Up-to-date status information for SOC species. Lists of species additions and deletions over time. Enhanced search and filtering functions for generating custom reports. Ability to save and print reports to an Adobe PDF file. Additional information for the species including documented county occurrences, habitats for animals, and additional status information for plants and birds. Please Note: This new report is optimized for MS Windows Internet Explorer 8, Google Chrome, and FireFox. There is a known issue that may cause a slower response in Internet Explorer 6 and 7. We recently added new maps and charts to the species accounts in the Montana Field Guide. Check out the Greater Sage Grouse example to see the new maps and charts. Today we're celebrating and honoring Sue Crispin's 29 years of service with The Nature Conservancy and the NatureServe / Heritage Network. Administrators at The University of Montana took over management of the Montana Natural Heritage Program on July 1, 2006. The program had been administered by The Nature Conservancy. Based at the Montana State Library in Helena, the Natural Heritage Program is the stateï¿½s source for information on the status and distribution of native animals and plants -- especially species of concern and important habitats such as wetlands. Its 18-member staff collects, validates and distributes information while helping natural resource managers and others use this knowledge effectively. The Montana Legislature established Natural Heritage Program in 1983 as part of the State Library, and the Library has contracted with The Nature Conservancy and now UM to manage the program. The Nature Conservancy in Montana has worked with landowners and other partners to conserve a half-million acres of wildlife habitat and ranchland in the state since 1979, but Crispin said the organizationï¿½s primary focus on land conservation made it hard to focus on support for the Natural Heritage Program. ï¿½As part of this transition we wanted the Program to become affiliated with a stable, established state institution that has a strong commitment to science and research, so UM was a logical choice and is a great fit for us,ï¿½ she said. The Montana Natural Heritage Program is part of a network of over 70 similar programs spanning all 50 U.S. states, as well as Canada and Latin America. Montanaï¿½s program is widely considered one of the best, Crispin said, citing her organizationï¿½s recent International Award for Technological Advancement. In addition to providing information on Montanaï¿½s native species and habitats, the programï¿½s staff of expert biologists also conducts field surveys. Among the interesting projects underway right now are surveys of amphibians and bats and a study of wetland changes along the Yellowstone River. For more information about MTNHP and to tap into its wealth of information on Montana animals, plants and ecosystems, visit the programï¿½s Web site at mtnhp.org. Contact: Director, Montana Natural Heritage Program, 406-444-3019 or Dan Dwyer, UM Vice President for Research and Development, 406-243-6670.